Stepped concrete seating and brass fixtures add interest to the otherwise pared-back interiors of % Arabica coffee shop in Kuwait, which has been designed by Nendo. 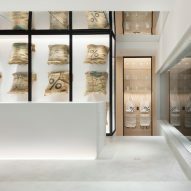 Located south of Kuwait City, % Arabica features bright white surfaces and gold-hued decor details intended to "symbolise the quality of [the brand's] high-end products". 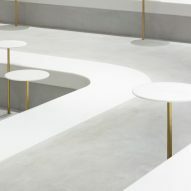 The 190 square-metre coffee bar occupies a corner building with a curved glass facade, allowing passersby a glimpse into its pale interiors designed by Japanese studio Nendo. 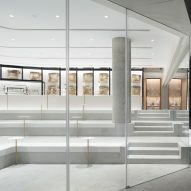 Stepped concrete platforms that serve as bench seats ascend from the store's entrance to the rear of the space where the service counter is located, allowing customers clear sight lines towards the street. Dotted in between are a number of white side tables supported by slim brass stems. "This stair-like structure maximises visibility and encourages interactions between the customers, thus making it a pleasant and comfortable place to enjoy a daily cup of coffee," explained the studio. 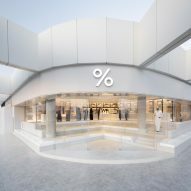 In total, the shop can host up to 30 customers and there is also an outdoor terrace area and extra benches which have been built into the shop's facade. 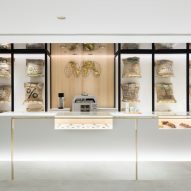 White-coloured coffee machines are meant to "almost disappear" into the store's rear wall, instead drawing customer's attention to linen sacks of % Arabica's own coffee beans, which are displayed inside black-framed glass boxes. Glass inserts in the counter also showcase baked treats. A curved corridor leads round to the shop's bathroom, which has been completed with white walls and timber doors. Glass carafes have been suspended from a gridded metal cage on the ceiling. This is the seventh % Arabica to open in Kuwait, joining branches across the globe in countries such as France, the Philippines, Germany, and Morocco. 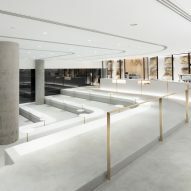 The end of last year saw one of the coffee shops open inside a ferry terminal building in Hong Kong – measuring at just 17 square metres, the shop's interiors are decked out with concrete and light-hued wood. 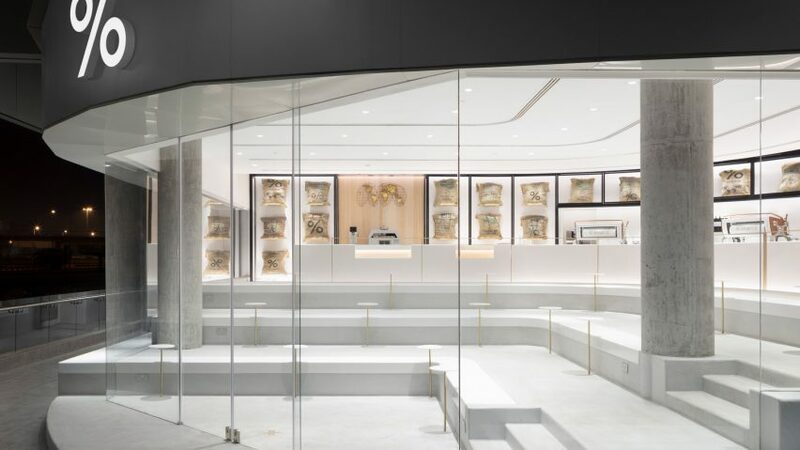 Although Nendo is widely known for product design, the studio has completed a handful of other interiors – back in 2017 they designed a chocolate and ice cream shop in Tokyo to resemble layers of cake. It has also created an entire exhibition on the Dutch graphic artist Escher inside the National Gallery of Victoria.